From what we get, we can make a living; what we give, however, makes a life. Arthur Ashe. 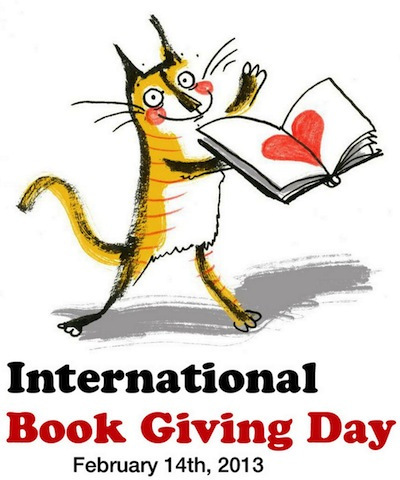 Consider Ashe's philosophy in view of the fact that February 14th is International Book Giving Day. While this campaign primarily aims to get more books into the hands of children, giving a book to an adult isn’t a bad idea either. If children develop a reading habit from an early age, who knows what might happen. They could become lifetime readers. Giving is good for the soul. It forces us to look outside ourselves, to think about others. Books are inexpensive gifts. In fact you don’t have to buy a new book for this special day; take one from your shelves or buy one cheaply at a second-hand store. The cost can be as low as you want to make it. If you decide to buy, you get to hang around a bookshop. Is there a better place to pass time? If you’re buying, please consider the One Book Pledge. Books are gifts that stay with a person for an entire lifetime. Both readers and writers benefit from the gift of books. After all, who are writers without readers? Don’t know any children? Maybe you could speak to your local librarian and see if there are books the library cannot afford that you could donate. Maybe you could leave a book on a bus, in a waiting room, or at the local rec centre. Determine your reader’s interests. Fiction? Non fiction? Favourite genres? What format do they prefer: e-books or paper and ink? Graphic novels or traditional? How well developed is their vocabulary? Check out goodreads for reviews and feedback. When you give someone a book, you don’t give him paper, ink, and glue. You give him the possibility of a whole new life. Christopher Morley. That doesn’t mean you can’t still give them a chocolate heart also. It is Valentine’s Day after all. Is there a better gift than a book? When you select a book for a friend, how do you choose which one?